Columbia is full of little restaurants I've never visited, and The Capitol Cafe was yet another one of these. I keep telling myself I'm going to eat on Main eventually, but somehow I never get around to it. I remember in particular I how I kept meaning to go to The Frog & Brasierre and didn't before it went under. I say the same thing about the new place in that spot, The Whig, but I haven't made that one yet either. I haven't even made it to Drake's, and that one's been there (or at least on Main) since forever! The State (in an article made difficult to google because they consistently misspell it as Capital instead of Capitol Cafe) says it will become a Dunkin' Donuts as does commenter Becca who liked the place. 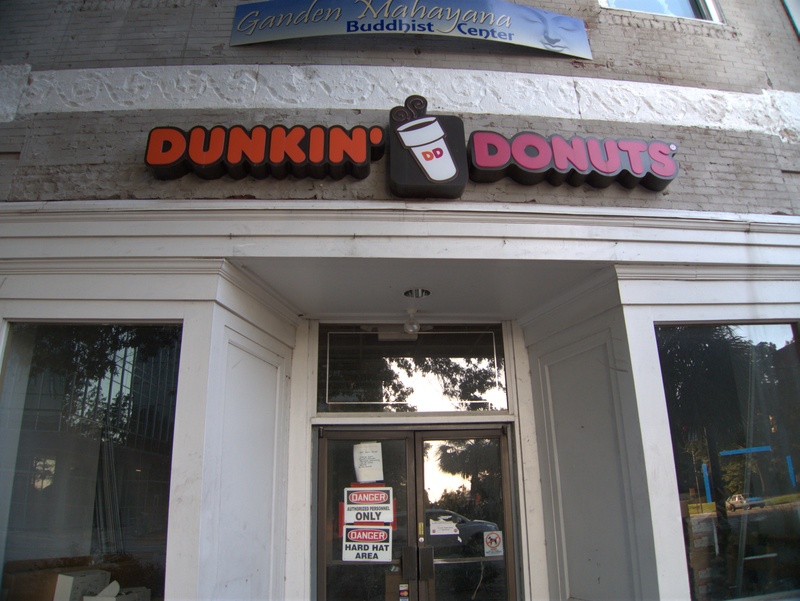 I have nothing against Dunkin' Donuts, but I still say we need a Krispy Kreme on this side of the river. UPDATE 2 November 2009: Well, Dunkin' has put up their marquee, but seems to be in no hurry at all to finish the interior and open the place. Also added Cat & Cleaver to the post title. Subscribe to comments with RSS or TrackBack to 'Cat & Cleaver / Capitol Cafe, 1202 Main Street: 2008'. Capitol Cafe was a good little place with a lot of character. In the likes of your average diner. Nothing to really write home about, but it was convenient to the State House and the BOA building. I ate there only once. The Whig would be a cool place if it weren't so darn smokey. Maybe October 1st will allow me and others to go there without having to burn my clothes after. I had something from Drake's once and didn't get sick, but a friend of a friend who used to work there says that they always mysteriously close and lock the doors in the middle of the day when the DHEC inspector is doing runs down Main Street. I've never seen their kitchen, of course, but the dining area is filthy. I think this place may go under as fewer and fewer homeless folks hang around Main Street. Unless its a racket, which is entirely possible, because I don't see how they continue to pay Main Street rent. This place has had a number of tenants. One of the more recent was was The Cat & Cleaver. In ‘79 or so, it was a BBQ place called “Porky’s,” run by local BBQ-meister Champ McGee, if I’m not mistaken. 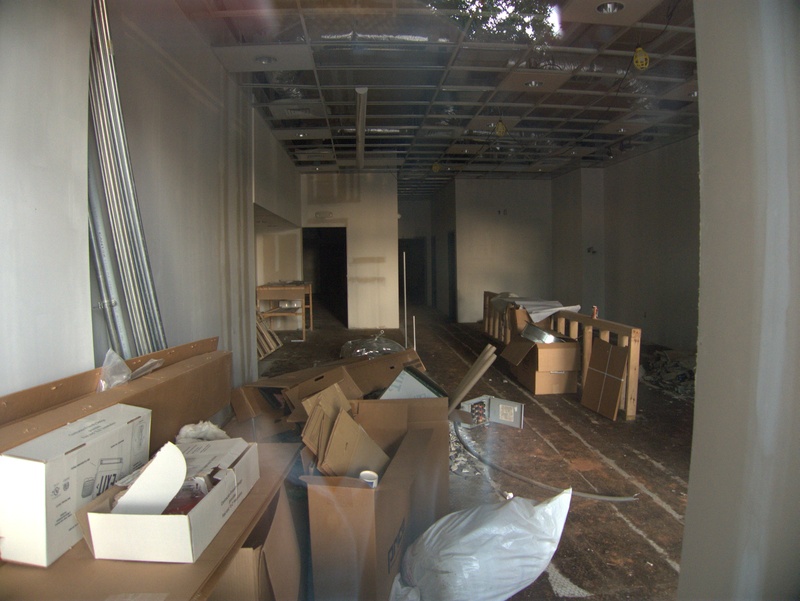 Later it was a soup/salad/sandwich type place called “Takin’ 5,” ’til around ‘85 or so. Also, the Dairy Bar moved here after for a while some time after it left its building on the other side of the Capitol and probably a bunch of others that I can’t recall. Last time I walked by, the sign was up for the Dunkin' Donuts, but looking thru the glass the inside was still a mess of halfway started construction remodeling debris. It might eventually open, but it's been almost a year now. A former college mate co-owned the place. When I had lunch there, Hugh told me not to ever open a restaurant. It seemed like a great location with students and government workers as potential customers. It was just long hours and no money for him and led to the closing of the place. I assume that limited parking and staggered hours of government and college may have played a part, as well as competition in the Vista. I took his advice and kept my money out of such a business. The Capitol Cafe was THE hangout for all the politicos from the State House. Long before the Lobby and the Cat and Cleaver. It was so funky--black and white bathroom tile on the floors and leather booths along the walls with a few tables in the center. A long bar on the left as you walked in had all the necessary sundries like milkshakes and banana splits. Food was "stick to your ribs" salt pork ham and eggs, but you went to the Capitol Cafe for the atmosphere. I think it was on Tuesday nights that a group of legislators would haunt the place and somebody would pull out a guitar and everybody would sing. It was probably a "good ole boys" club of sorts and the place where lots of backroom deals were made. In the 70s I remember local performers like Edwin Porter would serenade until the wee hours. Miss it. When most long-time Columbia residents talk about the "Capitol Cafe," they mean Jack and Amelia Siokos's Capitol Restaurant, which was a couple doors down from the Capitol Cafe that's pictured above. 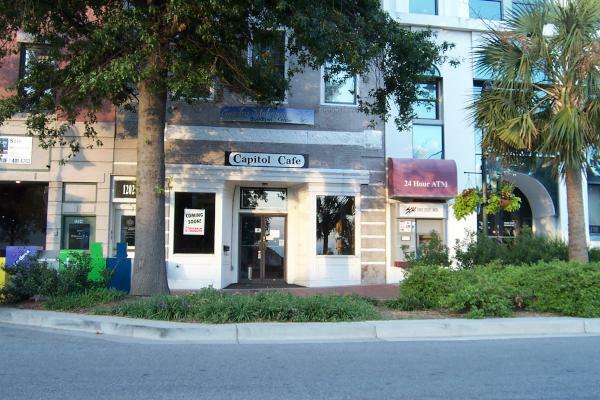 The Capitol Restaurant is where the politicos used to have their Tuesday night parties. loved this place also!!!! used to get the Half bird@ 3 am!!!! I'm looking for the owner of Cat & Cleaver, Cathy Calloway. Does anyone have a contact of any kind for her? I worked for her in the late 90's at Richard Burts restaurant Hannah Jane's. The Capitol Restaurant was to the left, this place was once called Scrooges, it was a deli/bar that catered to the downtown crowd and Capitol folks during the day and more of a bar at night. When Scrooges closed it became Wendy Ethel's. The Wade Hampton Hotel had become a dorm for USC so a lot of the business came from that. I lost track of the different places that came after that. But during the late 70's, Scrooge's was a fun place to work. The Capitol Newsstand was next door, The Capitol Restaurant was a great place to go, the movie theatre was a couple of doors down too. Capital was a great place to sober up. Would order a dirty shoe and a cup of mud. The Capital had no lic to sell alcohol, but because all the reps and senators would go there they got a pass. They hid bottle of booze behind a wall toward the back. If you told them your coke was a little flat, they would spike it for you. Don't forget Wendy Ethels....I was an original Wade Hampton Hotel student, and remember the capital cafe and Wendy Ethels well. Hey, Mark, so was I. We probably crossed paths a number of times.